The rumours have been flying and now we can finally present the forth generation of Lionel Messis Adidas F50 Adizero leather. It's going to be coming out in a yellow and black colourway, that you to begin with, only will be able to see on the feet of the aforementioned Argentinian. We already love it, but don't forget to tell us, what you think about it. In May 2010 Adidas revolutionised the boot-market, when they presented the first generation of Adidas F50 Adizero leather, with the astoundingly low weight of just 175 grams. Now the forth generation of the ultra-light leather-boot has landed and we will, of course, be taking a look at Lionel Messis new boots, right now. Since the first generation, it's been possible to choose between two versions of Adidas F50 Adizero; one with microfibre and one with leather. The latter of the two, doesn't have as much focus on the sharp touch and the ultra-light weight, it chooses rather to focus on a natural, soft touch from the leather and the comfort that comes with it. 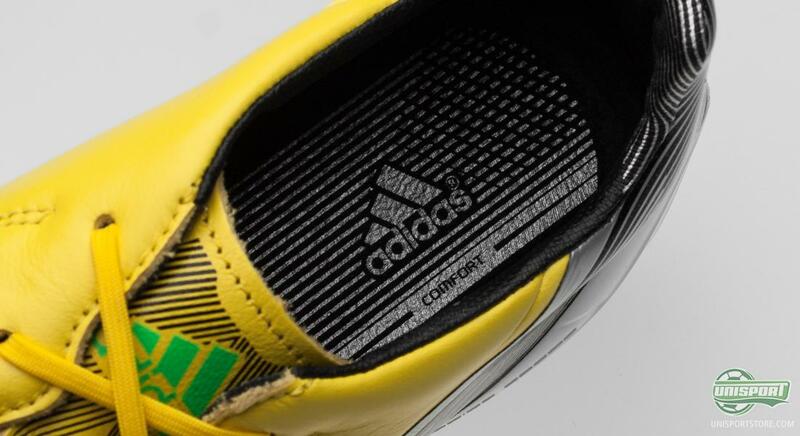 This also reflects in the differences in the boots and we take a closer look at this now. 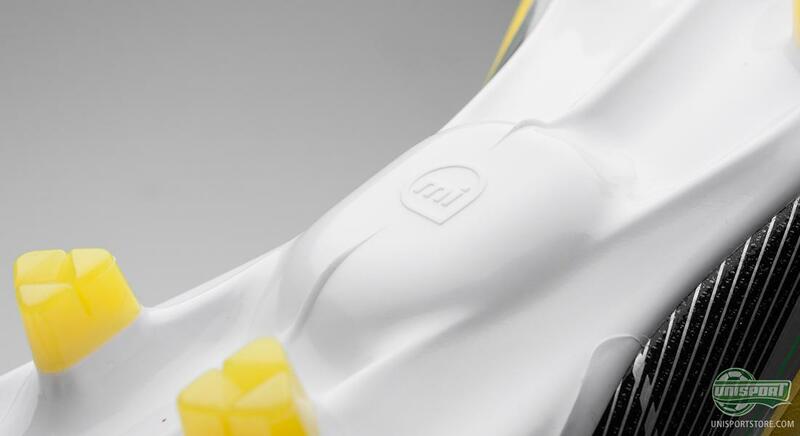 The boot is made of nice Goleo calf-skin, that covers every inch of the upper, from the nose all the way to the heel, where the Sprintweb takes over. It may not be as soft as kangaroos-leather, but on the other hand the Goleo-leather is significantly more durable, to compensate. 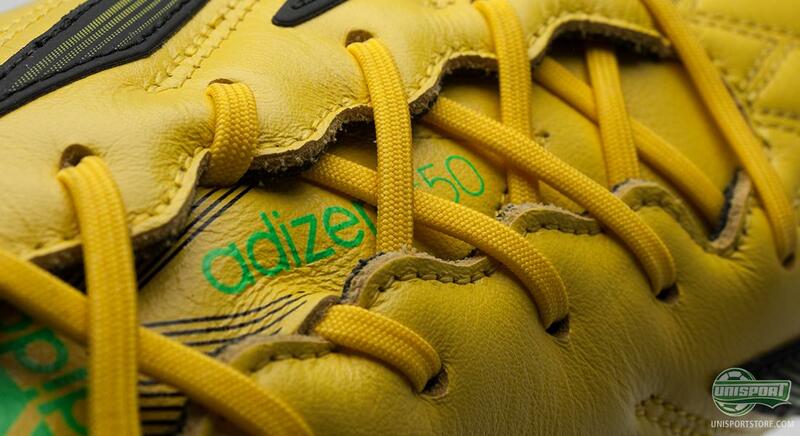 It's the same leather as used on the previous versions of Adizero, but now it covers a greater area. 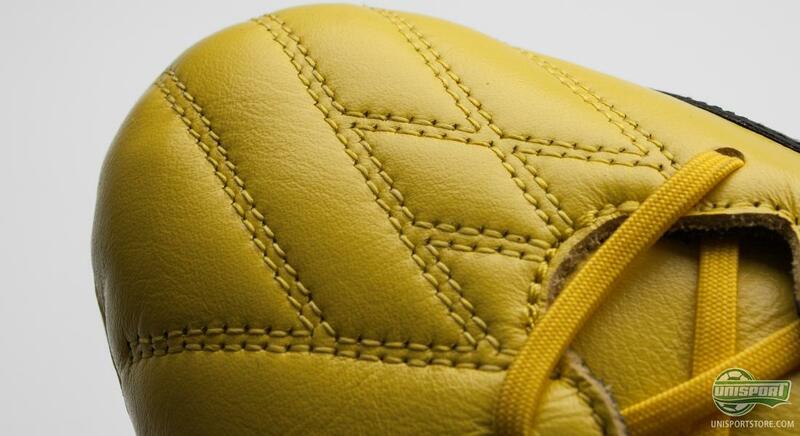 On the third generation, they only used the nice Goleo-leather on the front foot and the nose of the boot, on the middle of the foot however, they used a much grittier and far less flexible leather. Now it stretches all the way around the boot, so there's good reason for believing, the comfort will be far better on this version. Furthermore there's also grounds for thinking the elegant and natural touch you get with other leather boots, will be a feature on this boot too. The forth generation of Adidas F50 Adizero has gained a bit of weight, when compared to it's predecessors and it now weighs 203 grams, but keep in mind, that it's still a very, very light leather-boot. The extra weight comes as a result of the added Goleo-leather, that now goes all the way to the heel, but it will however still serve to help both the comfort and the touch. 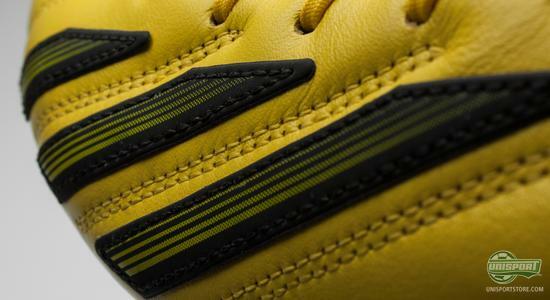 The Adidas-stripes on the outside of the boot, are also stitched leather and therefore also push up the weight of the boot a little. 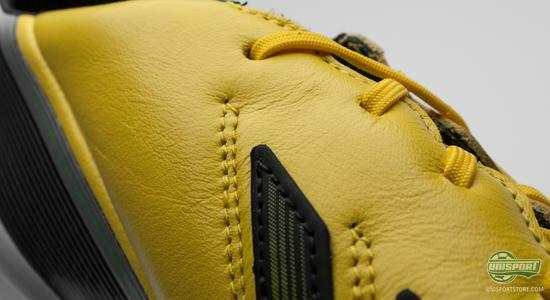 There has, unlike the microfibre-model, not been incorporated anywhere near as much Sprintweb on the leather-boot, as the natural material is strong enough to keep the foot stable and in place. 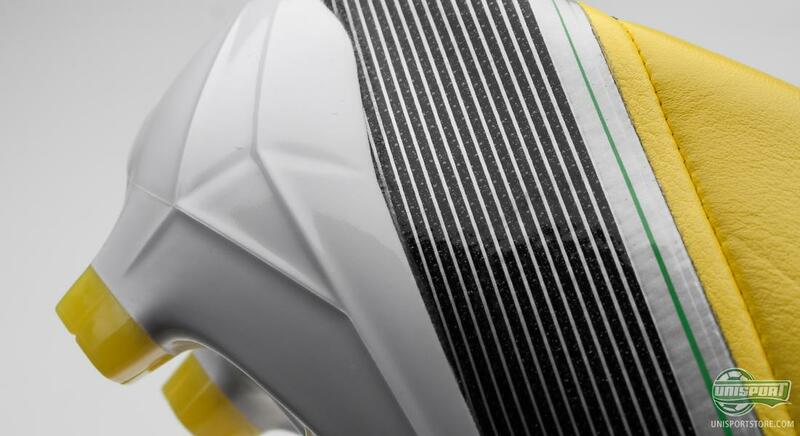 The heel has been equipped with Sprintweb, which is visible in the form of a silver and black stripe, that runs down the side. This keeps the heel really well in place, which therefore gives excellent comfort and you will definitely enjoy this part of the boots-design, when you need to turn on small areas. 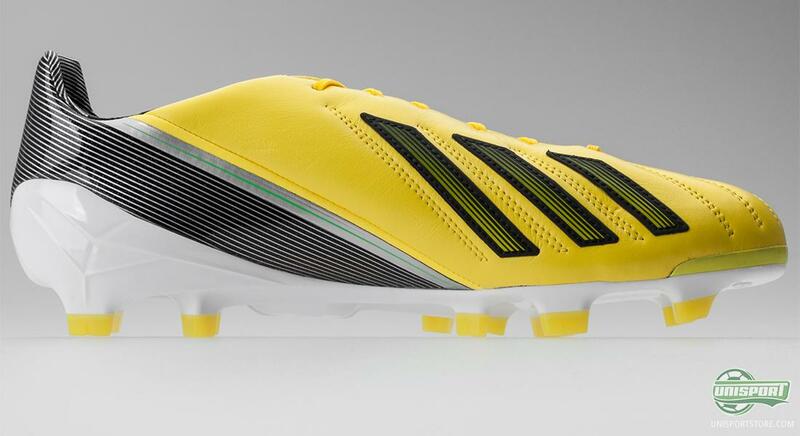 Adidas F50 Adizero leather-boot differs from the microfibre-version by having greater focus on the natural touch and increased comfort. This is also apparent when you look at the inside-sole, that is far more padded and shock-absorbent than the lightweight-sole in the microfibre-boot. Furthermore the nose of the boot is also raised slightly, so you have more room for your feet in the front of the boot and that is definitely worthy of consideration, when your looking to choose between the two. If you remove the inside-sole, the Micoach-bubble will be visible. 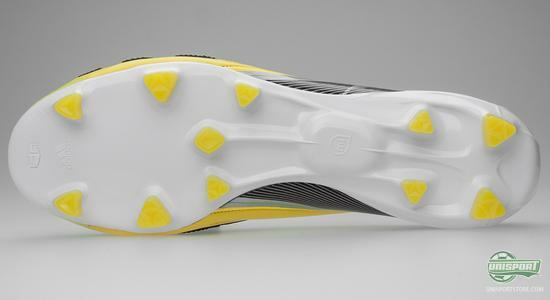 It's a small hollow room in the boot, where you put the intelligent Micoach-chip. The chip can be used for training and games, to track your own run-data, like number of sprints, top-speed, average speed and much more. Afterwards you can read and analyse your data on your Ipad, Iphone, Mac or PC. So stop bragging about your speed, because now it can be proved. 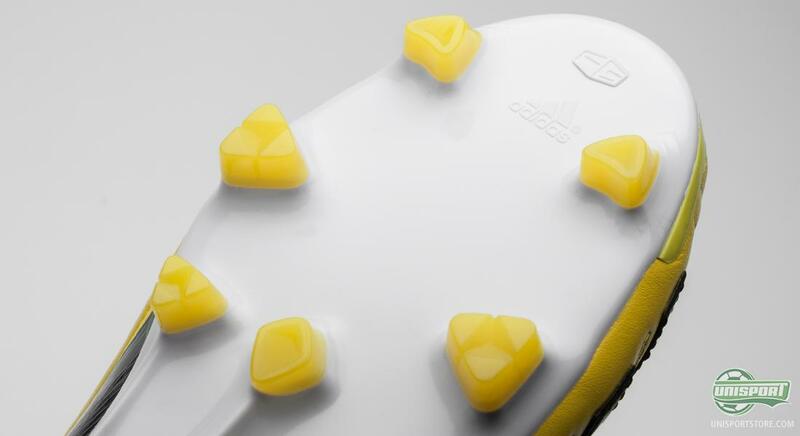 Adidas have kept the same outer-sole and the same stud-configuration, as they used in the former generations. This means, that it's still the mega light and flexible Sprintframe outer-sole that they will be using and trust us, we aren't complaining. With the addition of the Micoach-bubble, the sole has been given increased stability, at an absolutely crucial area of the boot. It means the Sprintframe bends in exactly the right areas and creates the necessary stability, which works really well. The soles design is further supported by the Traxion 2.0 Stud-system, that's built up around the well known triangular studs. This helps give you higher acceleration and comfort when running at high speed, as well as getting increased grip in the pitch when you run sideways. Furthermore you also have the middle stud, that greatly assists your deceleration, so you always can be one step ahead of your direct opponent, whether it's when speeding up or slowing down. 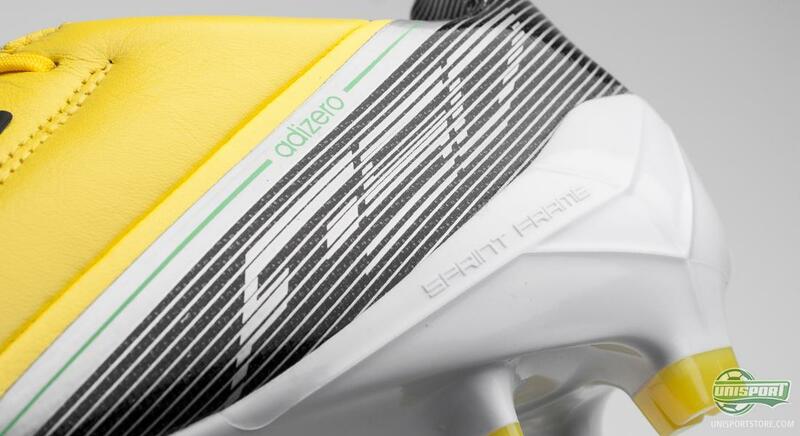 The new Adidas F50 Adizero might already get its debut, at the feet of Lionel Messi this week, before he's accompanied by the rest of the Adizero-stars. We are already impressed by the forth generation of Adidas' lightweighter and are really looking forward to reviewing it. What are your thoughts on the nice new boot? What do you think of the colourway? Share your thoughts in the comment-section, down bellow.